LTH Home > Chat > Beyond Chicagoland > Washington DC? hang on thomas, you are giving up restaurants that are like 70 miles apart in the DC area and then comparing them just to the north side of Chicago? The one area in which Washington leaves other cities behind is Ethiopian food. DC also leaves Chicago in the dust as far as quality of service at the high end. Overall, as far as selection at all levels, Chicago wins. is making all his reservations under the name Steve Plotnicki from now on. Needing to get out of town for a weekend, the Wife and I spent this past weekend in Washington DC. We had two very good, but contrasting dinners at Komi and the Blue Duck Tavern. Pork belly gyro - Amazing. A perfectly braised piece of belly wrapped inside some flatbread with cucumber. Caesar salad - Alinea-esque. This looked like a giant crouton. When you bit into it, it released the representative flavors of a Caesar salad. We then each had a choice of pasta. I went with spaghetti with habanero, crab and sea urchin. 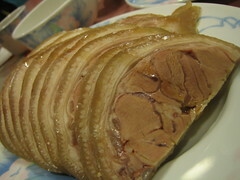 Obviously this dish doesn't work without top notch ingredients, and that is just what Komi presented. Combined with a little heat from the habanero this was a nicely balanced dish. The entire portion was only about 5 or 6 bites, which was actually perfect (at both meals it was striking how much smaller portion sizes were in DC compared to Chicago). For my main I had lamb. Sliced tenderloin, nicely seared, etc. But the Wife's fried soft shell crab stole the show. Without a doubt the best soft shell crab I've ever had. Large, perfectly fried, no grease, sweet, meaty. Words can't do this crab justice. For dessert I had Greek donuts with chocolate pudding, which were just as good as they sound. Service was fine. Nothing stellar, but no complaints either. Overall I was really impressed with Komi. I knew it was Greek-influenced, but I did not know about many of the modern flourishes that were part of each dish. 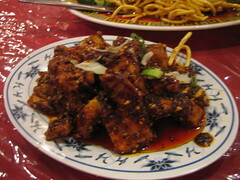 In every case, the influence of modern techniques was able to enhance the individual dishes without just relying on the "gee whiz" factor. I'll be curious to hear what you thought of BDT. I was there again last week and had another reliably (very) good meal; it's my favorite "regular" stop in D.C. (unfortunately, Komi is closed on Sunday and Monday, the two days I was there.). Had the marrowbones--BDT does my favorite interp of it--a braised rabbit tagliatelle not all that dissimilar from Mercat's version (different pasta, less sweet, same idea), a simple but well-prepared scallops dish fragrant with anise and fennel, and a veggie side dish of globe artichokes strewn and saturated with duck ham. The woman sitting next to me was from San Fran and was aghast that farm-to-table was a concept/shtick; I'll admit the place can be precious, but I think they execute consistently and the food's always very good. The biggest surprise of my trip were a couple of very good dishes at Zatiniya, one of Jose Andres's places. He's always struck me as D.C.'s LEYE--you know, consistent but banal food--and several of the dishes I had fit that, but I thought the kibbeh nayeh and a seasonal mushroom salad I had here were way better than they had to be. Pretty room to boot. I liked Blue Duck Tavern but for entirely different reasons than why I liked Komi. As you said, this is no frills "farm to table" cooking. If you order scallops, you will get scallops, and nothing else. Vegetables and starches are all a la carte. I started off with the marrow bones and they were outstanding. I don't understand why more restaurants don't offer this dish. The bones are sliced vertically so it's incredibly easy to get all of the marrow out. The parsley and garlic used to season the marrow really add nicely to the whole thing. My one complaint...for two huge bones you get 3 little pieces of toast. Our waiter was happy to bring more, but come on. The Wife had the Boston bibb lettuce salad, which was really just a bunch of lettuce on a plate with grain mustard dressing. Simple and very delicious. For main courses, I had the roasted lobster and the Wife had crab cakes. Both were very good, although my lobster was a bit tiny and a little been mushy. The crab cakes were excellent, with very little filler and a whole lot of crab. For our sides we went with fries (I believe they're cooked in pork fat? ), grits, and seasonal greens (rainbow chard if I remember correctly). I thought the greens were the real standout. Dessert was apple pie with vanilla ice cream and peanut butter/banana ice cream. The pie was a little individual pie (you can watch them prepping and baking them when you walk into the restaurant. The ice cream is also made in-house. The pie and ice creams were all excellent. If I lived in DC, Blue Duck Tavern is probably someplace I'd go fairly often if I were looking for a nice dinner (something at the level of Naha or Blackbird). The food is very straightforward and I would think the kitchen puts our a fairly reliable product. There is no flash here, the ingredients are left to speak for themselves (which is why this restaurant provided such a nice contrast to Komi). at the lower end of things in DC... for an inexpensive meal, Amsterdam Falafel has the best falafel I've ever had. ... a lot better than anywhere I've had in Chicago. The falafel is wonderfully flavored, with a slight spice to it, maybe a garlic.. most importantly though, there's actually flavor to it, it's not just a ball of fried food like so many falafels tend to be. they have a $10 special of falafel+fries+drink, tax included. 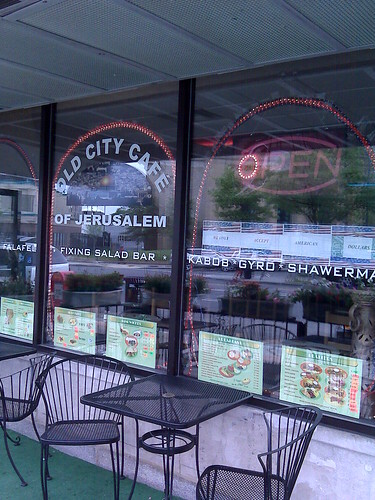 ...if you want something very similar but maybe a menu with more variety, Old City Cafe has good food/sandwiches... some say the falafel isn't quite as good as Amsterdam, but personally I liked their "toppings" bar better. 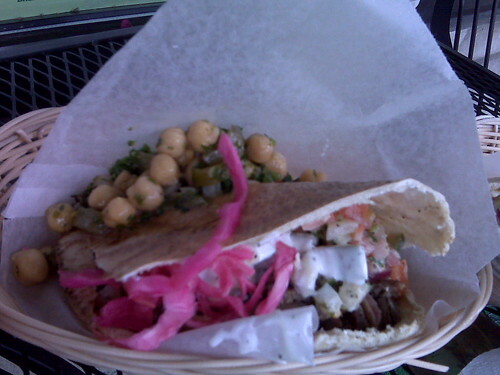 I didn't have their falafel, instead I had a beef shawarma, which was tasty. the day I went they were serving a fresh squeezed lemonade that was made with rose water. Very delish. the atmosphere is quirky, with multi-colored fluorescent lights.. they have a nice outdoor sidewalk patio to eat at. 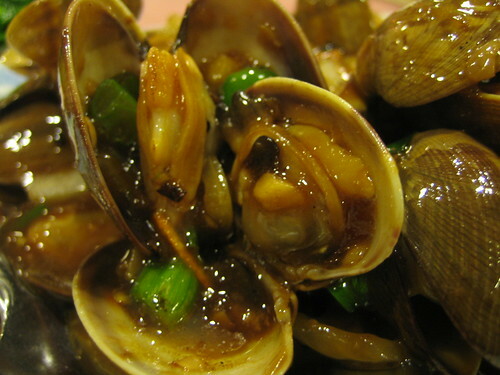 both in Adams Morgan neighborhood..
Seth Zurer wrote: You should get the finest clams and black bean sauce known to man, a dish that makes the version loved by GWiv and Evil Ronnie at LTH seem insipid and dull by comparison. Highlights included Salt and Pepper Soft Shell Crab, Grouper Fish Spicy Fried, Pan Fried Dumplings and Leek Flower. What I particularly liked about the meal, aside from the company which included Jonathan Zuer, Seth's smarter and more handsome brother, Stephanie, a colleague of Jonathan's, and Bruce Cook and bride, was the feeling I had of coming home the moment I walked in the door. Full Kee is truly a special place, on the order of 'Little' Three Happiness and I would be there often if I lived in Washington DC. I should note the mentioned Full Kee meal occurred last year, I didn't post until now as intensive therapy was required to move past Seth's hurtful clam comment. 509 H Street, N. W.
Full Kee without the Hong Kong style shrimp dumpling soup?!! I just cannot imagine it. RAB and I lived just up the street from Full Kee for 2+ years and it was the best Chinese in the neighborhood. Thanks for the photo of the tasty clams - - definitely one of our favorite dishes, although I haven't tried LTH's for comparison. REB wrote: Full Kee without the Hong Kong style shrimp dumpling soup?!! I just cannot imagine it. Thanks, Gary. That soup is one of the best deals in town and it really hit the spot on cold days. Goodness, you almost have me missing D.C. Almost. I would also highly recommend Florida Avenue Grill for breakfast. Fantastic hot cakes and biscuits and gravy, the best I've had in a while. We are periodically in Washington, D.C. and Florida Avenue Grill is always on our list of places to visit. I have never been there for breakfast, now I am aware of their biscuits and gravy, well we'll be doing breakfast. I have often been to Florida Avenue Grill for mid afternoon lunch. This is southern food, which Ourpalwill would approve of. There are smother chicken fried steaks, fried chicken, ham on the bone plus your choice of side dishes. Or you can simply order a plate of 4 sides with macaroni and cheese and candied sweet potatoes an absolute must. Once after I was seated, the 7-year-old daughter of a waitress came to our table. She inquired if we were indeed going to eat there. I cheerfully responded yes. She then offered her experience, "People like you always order take out. You never stay. Nobody like you ever eats here." All the while, her melt-into-the-ground embarassed Mother was trying to disconnect the thought and drag her away. I have been going to the Florida Avenue Grill since the late 1980's, based on recommendations from the Sterns. My first visits always had a sense I integrated the neighborhood by simply showing up. There were cracks in the sidewalk with weeds growing between them. There was a gravel lot adjacent to the Grill that was either the remnants of a teardown or the parking lot. I parked on the street largely to avoid offending any neighbor's sensibilities if I happened to guess wrong. Inside the Grill, it was business conducted very politely and efficiently. The Florida Avenue Grill streetscape I describe lives on in my mind's eye only. Upon arriving Sunday, there was a realtor stabbing an open house sign into the ground. The gravel lot transformed into a condominium building. The sidewalk repaired. People lingering on the street chatting, which I never saw before. When Rene G, Josephine, a friend and I arrived on Sunday, we were lucky to find four stools together at the counter. If we had desired a booth, there would have been a wait. When the cashier asked a young professional how he liked his meal, he responded, "Very good, as usual!" There young urban crowd co-mingled with the old timers ordering breakfast or lunch specials. The Sunday crowd caused the menu to be truncated: full breakfast menu and an abbreviated lunch selection of five specials all priced at $14.95. Another nod to their current flow of customers, the bacon was no longer cooked to order, instead it was previously cooked and reheated on the grill. While Josephine and Rene G were in breakfast mode ordering scrapple, Virginia ham, eggs and such. I inquired if I could have a vegetable plate, which is not on the truncated luncheon menu. The waitress affirmed could be had for $7.95, then rattled off my choices. I settled on greens, mac and cheese and pickled beets. In retrospect, I should have had the sweet potatoes instead of the beets, but I didn't think. I also ordered biscuits in addition to the cornbread that came with greens. After a few days of non-stop eating, it was nice to have a plate of well prepared vegetables. The biscuits were made earlier came from a warming tray. Unfortunately no butter was offered, while not the freshest biscuits, they certainly did not deserve the non-butter spread offered. Long ago the Florida Avenue Grill was quite a special treat. Probably due to my occasional meals in soul food restaurants around Chicago, my more developed experience dimmed the specialness of going to the Florida Avenue Grill. Or maybe I am just a bit resistant to change. Thanks for the tip, Mhays. I've been to LTH, but haven't sampled the duck soup. I do have a nasty sore throat - - perhaps I can convince RAB to rescue me from work and take me there for lunch. The duck soup sounds like the perfect remedy. Cathy2 wrote: Long ago the Florida Avenue Grill was quite a special treat. Probably due to my occasional meals in soul food restaurants around Chicago, my more developed experience dimmed the specialness of going to the Florida Avenue Grill. I'm a fan of the Florida Avenue Grill, but, as Cathy2 mentions, it isn't the perfect spot. Before leaving D.C. just over a year ago, I lived pretty close. My problems, more than anything, were the hours and the prices. They often seemed to be closed when I had a hankering for their fried chicken. Good stuff, though, and great atmosphere. I've directed folks there as a nearby alternative to Ben's Chili Bowl. NW D.C. doesn't have many diner-type spots, so Florida Avenue Grill certainly fills a need. If it existed in Chicago, I don't think it would be nearly as popular. Cathy's post sums up my impressions pretty well. However, she did not mention the side of (likely) baked apples with a tiny touch of nutmeg that were the highlight of the meal. Though I enjoyed the crispy scrapple and my over-easy eggs were cooked perfectly, I was somewhat disappointed with the biscuits, which were hardened on the edges-we just missed the fresh batch by seconds. And no honey. I need honey on my biscuits. What Cathy also forgot to mention was the gallery of autographed portraits of familiar faces smiling down on us from above the counter: Denzel Washington, Ron Brown, and (according to Cathy) Evelyn "Champagne" King side-by-side with John Ashcroft. It's probably unfair to confine the Florida Avenue Grill to the diner category, it's more of a slice of Washington. And I thought the welcome and service quite friendly indeed, given the crush of patrons. I liked Florida Avenue Grill quite a bit, as much for its historic vibe and bustling atmosphere as for the food. My plate of ham and eggs (supplemented with a piece of Josephine's scrapple) was very good. As mentioned above, the biscuits showed promise but we got stuck with the end of an old batch. If it hadn't been so ridiculously busy I would have considered asking to trade them for freshly made. 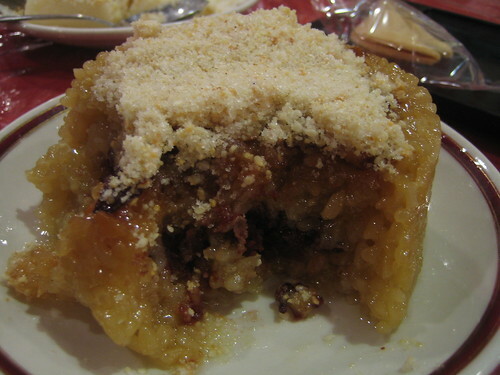 Those stewed apples were absolutely brilliant, a perfect accompaniment to ham or scrapple. There are many, many threads on DC, but I like to keep things in one place. So here we go. I leave for 4 days 3 nights on Friday. After 20 minutes of searching through a number of threads, I found about 27 references to Vietnamese in Falls Church being better than anything around here, but not one restaurant name and detail (I am *sure* I missed it somewhere). I've had 3 excellent experiences at 4 Sisters, but I just learned it moved a bit further out and my friend who is willing to drive a ways for great food says it is a bit more of a trek now. I get the feeling that 4 Sisters may well be the most media-friendly face of that ripped-from-Hanoi eating mall, but it also has served the best ban xeo I've ever eaten. 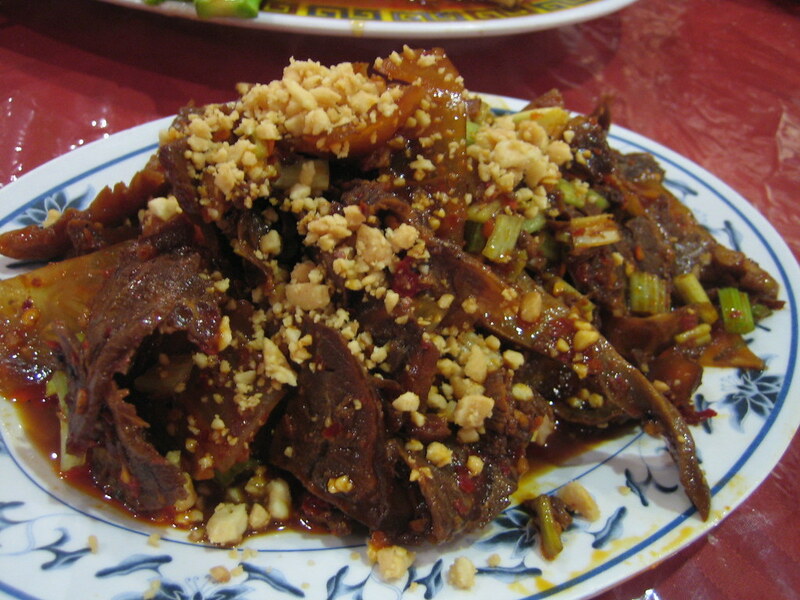 So any recent, specific intel on Vietnamese dining in and around DC? Specific recs for Burmese in MD? I foresee a couple of brunches and grabbed the names of Cashion's Eat Place, Tabard Inn and Cafe Atlantico as some interesting options. Feel free to chime in here as well. But mostly, I'm an LTH'er who needs some Some Southeast Asian help! gastro gnome wrote: There are many, many threads on DC, but I like to keep things in one place. So here we go. Hi. My info is now verging on stale, but still thought I should weigh in. Burmese, Vietnamese - - and Ethiopian - - in my opinion, are wonderful in D.C.
A few doors to the left of where Four Sisters was, you'll find Huong Viet. Great, friendly owner, happy to make recommendations. On weekends, it's usually full, but rarely is there a wait. We frequently ate their crispy spring rolls, grilled pork (Bun Thit Nuong), shrimp with sugar cane (Banh Hoi Chao Tom), and lotus root salad. They're happy to provide rice papers so that you can make your own rolls. 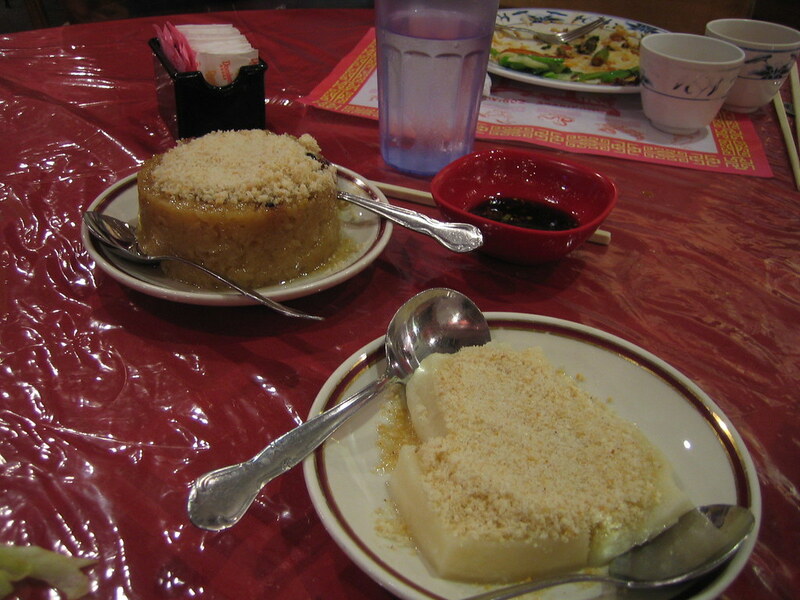 Great soups and crab fried rice, too. Huong Viet is my favorite restaurant if I'm only going to one Vietnamese spot. If you want something more adventurous, wander inside the mall. I can't remember the names any of the places, but it's where you go if you want to be the only non-Vietnamese diner. Two favorite dishes not available at Huong Viet, but that you may see on other menus and want to order: Bun Cha Hanoi and a chopped, sauteed clam appetizer served with shrimp crackers. I think there's only one Burmese restaurant in MD - - Mandalay in Silver Spring (metro accessible). We like the salads, especially the tea leaves and the ginger. Also highly recommend the pickled mango pork and the chicken with sour mustard, onion, and cilantro. Be careful - - if you order extra, extra spicy, you'll get blazing hot food. And, yes, even though there's a Burmese place in Chinatown, Mandalay is worth the trip. I like all of your brunch options. Understand, though, that brunch is a minor affair in D.C. Tabard is great for a weekend brunch if the weather's nice and you can snag an outside table. Donuts are solid. Quiches are usually reliable. Tabard isn't the best food ever, but it's usually good and the Inn has character. Cashion's is your standard slightly-upscale brunch - - decent, but nothing special and not better than what's available in Chicago. Cafe Atlantico is much fun for brunch. I've said it before and I can't resist saying it again - - the two places I will be sure to visit on any D.C. trip are Komi and Habesha Market. The two restaurants couldn't be more different or more delicious. If you go to Habesha for Ethiopian, I recommend the lamb awaze tips (say spicy if you don't want it mild) and a veggie sampler including the usually spectacular red lentils. It's a cabbie haunt and two can eat a ton of food for under $20. You go to the counter and order. Run out of injera? Just ask and they're happy to provide more at no charge. 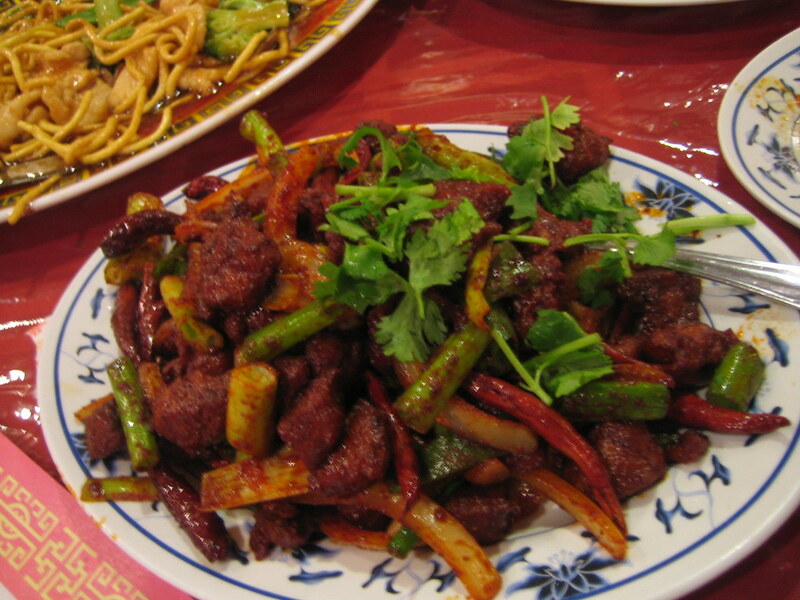 Unless it's the height of the lunch rush, avoid the already-made meat dishes. You pay at the register when you're done. If you'd like a nicer Ethiopian spot, Etete is solid (I like the Yebeg Wat). Hope you have a great trip. Let me know if you need any more info. where will you be staying? I will be staying in Capitol Hill, but I will be mobile, motivated with periodic access to a motor vehicle. 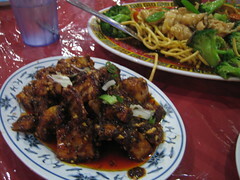 When I was in Washington, D.C. recently, I was advised Rockville, MD was the place to go for Chinese food. Outside of Dmkly's great find situated between Washington and Baltimore. Is it true about Rockville? gastro gnome wrote: I will be staying in Capitol Hill, but I will be mobile, motivated with periodic access to a motor vehicle. Also, if you're around for a Sunday night dinner I'd check out Commonwealth Gastropub over near Logan Circle. They do a Sunday night roast for dinner. Just a couple more places you might consider- if you're a burger fan, Ray's Hell Burger over in Arlington, VA. If you have a car I love the Lebanese Taverna Market over in Arlington, VA, though if you want to push out without a car there's one over at the Woodley Park metro stop in DC. I always loved Hank's Oyster Bar for brunch, but it's pretty light on the eggs and pretty heavy on the lunch. That's in DuPont circle. One more brunch spot is The diner in Adams Morgan (DC), which is what it is, but a good diner at that. They have two sister places right by as well- OpenCity which is right around the corner from the Woodley Park metro stop, and Tryst, right next door to the Diner. Tryst is really just a coffee shop, though it can be a fun place on weekend nights in the middle of the craziness that is Adams Morgan as they do serve alcohol at night and have live music. Beware, however, Adams Morgan is a total sh*t show at night on weekends. Rockville is the place for Chinese food in the area. 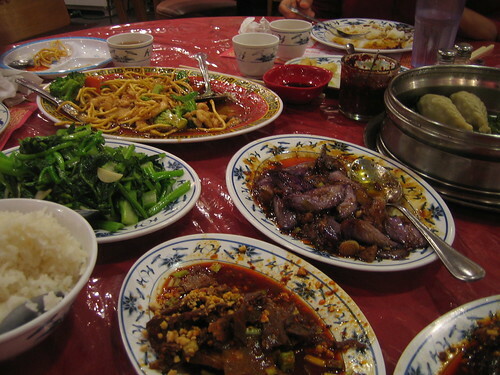 DC has no decent chinese food except what you'd expect from americanized chinese. That said, DC does have Mr. Chen's, which is totally americanized chinese, but also totally organic, so that's kind of cool. I've been to Joe's a few times. Do you think, though, that it's worth the drive from Capitol Hill to Rockville? Sure, if you live in D.C. it is. But, I don't think that Joe's is better than Chinese food in Chicago. Hmmmm Ronna, I dunno. First off I don't know Chicago Chinese beyond where C2 took me one night (sorry C2, I've forgotten the name of the place ), and a few times at Lao Sze Chuan. But I'd have to say that some of the dishes at Joe's were better than similar dishes I've had in Chicago. Joe's is just plain AWfully good. Geo wrote: Hmmmm Ronna, I dunno. First off I don't know Chicago Chinese beyond where C2 took me one night (sorry C2, I've forgotten the name of the place ), and a few times at Lao Sze Chuan. But I'd have to say that some of the dishes at Joe's were better than similar dishes I've had in Chicago. Joe's is just plain AWfully good. LSC is still a place we miss dearly and when we visited the DC area (ok, Herndon) it was well worth the trip to Joe's. 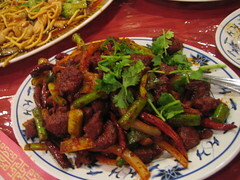 As far as Sichuan food goes, we went with what we were familiar with (thanks primarily to LSC) and Joe's was easily on par. Foo chi fey pien (that's what I asked for – not sure what it is on menu– probably A29, but the proprietress smiled and nodded when I asked). What we got was wonderful. 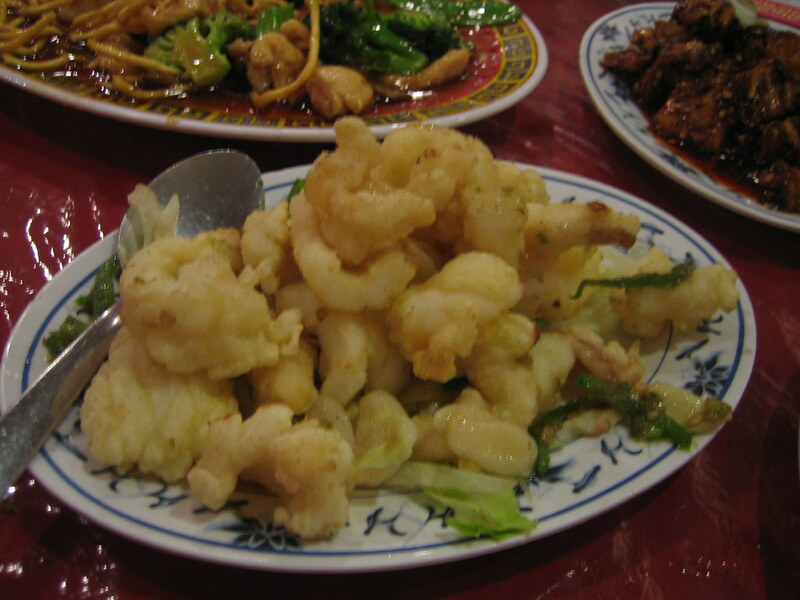 really good salty crispy squid, very good dumplings (great dipping sauce/oil), the yu xiang eggplant was spot on! 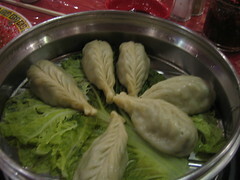 the vegetable (on choi? Possibly – I asked for a suggestion and if I recall correctly went with what was on the specials board) was a perfect accompaniment. Usually I don't order dessert at a Chinese resaturant, but since two kids were there and we were showing our friends and hosts what good Sichuan food they had in their town , we got the eight treasures (rice filled with sweet red bean paste and topped with crushed sesame and sugar) and the pounded sweet rice (this was like mochi almost). Both were excellent! And while I'm at it, Full Kee was super. Great pix sazerac! DANG, you take me back to such good meals in Joe's and Full Kee. 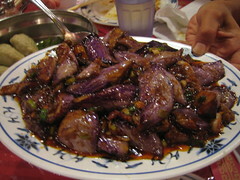 Let me know when you're coming up to Montréal, and I'll put you in touch with some excellent *Fujian* food! For a small hole in the wall, Habesha Market is extremely clean, bright and comfortable. We ordered at the register and got to watch the chef go to work in her immacculate kitchen. In impressively short order, our deliciously spicy and complex veggie platter was ready. A few minutes later, we were also eating "Sepecial Foul", described on the menu as "Hearty chile like broad beans, smashed & spiced, then garnished & mixed with fresh diced tomatoes, jalapeno peppers, awaze and onions, served hot with a dollop of yogurt & egg with a choice of olive oil or butter." This was a fantastic breakfast dish - smoky from the roasted jalapeños, with fresh vegetables, perfectly tender beans, and a small, soft omelet. Good coffee too. When I'm thinking breakfast, Ethiopian doesn't always spring to mind. It should. On our first night, we had dinner at Montmartre, a quintessential French bistro. Casual, homey feel, reasonable prices and the friendliest possible service. Excellent liver and onions, fantastic "Floating Island" dessert with the world's lightest meringue. Escargot a little too tame on the garlic for me, and a tile fish special that could have used a little less time in the oven, but was perfectly edible. Montmartre struck me as the kind of neighborhood place that locals flock back to even though the food is hit and miss, because the staff are so darn warm and friendly and the prices are reasonable. I'd probably be a regular myself if I lived in the hood. In Dupont Circle, there is an open-late Middle Eastern spot called DC Cafe. The effects of hunger, laziness and beer consumption set in, so several of us ordered 2am falafel sandwiches. Tasteless balls of grease that didn't even hit the spot for people in our state of mind. Tryst is a wine bar/ cafe/ bakery/ lounge/ all things to all people place that I found myself at twice over the weekend. Pastry was stale, coffee was cold, tables were dirty, and the place was obnoxiously loud. Two Brothers beer on tap though. I was in D.C. last week as well, finally getting to Full Kee after nearly a dozen visits to the nation's capitol over the last two years or so. Comparisons to LTH are obvious, as is the affection for the place here. The soft shell crab was, as others have repeatedly mentioned, tasty, albeit a bit salty. At $16, however, I didn't see it as anything significantly better than what I had at LTH in February, where it was $11. We ordered the chive flowers, which were tasty but not $13 tasty. My perplexity over vegetable pricing at Chinese restaurants continues. The kitchen seemed to have, to put it mildly, issues: we were served the vegetables and crab relatively quickly, and then waited 30 minutes for the noodles; there were people who were served within five minutes of entering, and others who had come in 20 minutes before and still waiting as those newcomers were served. For all I know, though, the cook was raising the eggs that went into the noodles. I note the prices not to cry wolf but to convey the reflexive thinking that is inevitable when eating at a restaurant of comparable style and execution to one in Chicago. I can only compare it to eating at Mizrahi in Highland Park: e.g., Yes, this stuff is pretty darn good--but is it appreciably better than what you can get on Kedzie for a much lower price? Pause. 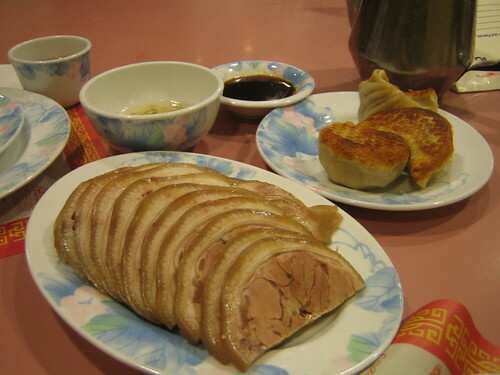 In this case, this was a three-dish, $50 dinner that would have been $30 at Sun Wah. Hard not to notice the difference. Because you're in the DC area where every fixed expense and variable cost ends up being pricey.